The world has been given its first sneak peek at Pebble’s smartwatch prototype that set a crowdfunding record on Kickstarter. But is the watch worth the hype – and all $10 million its Canadianfounder raised online to get it off the ground? 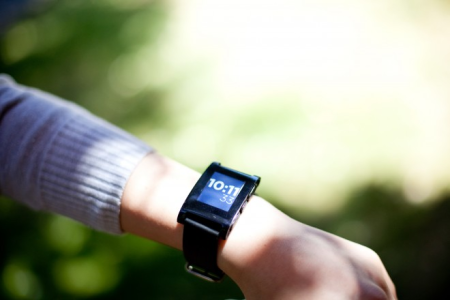 First close-up look at the Pebblesmartwatch. So far, yes, according to the first ever hands-on review of the watchby Wired.com. The tech news site recently got to spend one hour toying with aprototype of the watch and visiting with Canadian founder EricMigicovsky at Pebble’s office in Palo Alto, Ca. And befitting Pebble’sstartup status, that office is still based in Migicovsky’s apartment,though probably not for long judging by the people lining up for apiece of Pebble’s action these days. It practically gushes over the watch from a style point of view, sayingit sports a “smart, sophisticated design that’s less bulky than anearlier smartwatch made by the Pebble team. Migicovsky said the watch’s lithium ion polymer battery can last up toseven days and noted that Pebble has already ordered $1 million worthof components for the device, is partnering with third-party appdevelopers to create compatible apps (including a fitness oriented oneby RunKeeper), and is teaming up with another Kickstarter projectcalled Twine on an app that will alert Pebble smartwatch wearers tothings like someone knocking at their door or even let them know theirbasement is flooding. The Pebble team heads to China soon to visit manufacturers there whowill start producing the record-breaking smartwatches backed by over67,000 people on Kickstarter.